Home Bone Health Could Eating Ghee Change Your Life? I will say this much though, ghee can definitely produce some positive affects on your total health…and, it can certainly make the taste of your meals improve significantly as well. Ghee is produced when butter is heated into its liquid form and then all milk proteins are then separated from the milk fats. These include casein, lactose, and whey. What you’re left with when you consume ghee is the remaining fat, along with other micro nutrients which are beneficial to your health. Now, of course, you can expect what I say next to be a pretty standard recommendation if you’d like to use ghee to experience “Health As It Ought To Be”. If you’re going to use ghee to cook with or to eat, it needs to come from grass-fed cattle. The reason why? Ghee which comes from grass-fed cows will be higher in the healthy nutrients that contribute to better health, and, in turn, it’s going to be lower in potentially inflammatory constituents. Take a look at what I consider to be the top 3 reasons to start using grass-fed ghee today. As I mentioned before, when you produce ghee, you’re leaving behind nothing but pure fat and other nutrients. Part of the reason this is beneficial is many people with sensitivities to dairy are able to enjoy ghee. The proteins and sugars generally responsible for causing allergic reactions are banished to the garbage bin, giving you the freedom to enjoy dairy in a very pure and refined form. It’s like having your cake and eating it too (minus the sugar, the gluten, and…well you get the idea). Left behind are two important fats and very powerful nutrients we’re quite fond of here at Health as It Ought To Be. 1. Ghee is rich in CLA. I only recently wrote an article on CLA. If you’d like to learn more about CLA and its health properties you can check out the article I wrote by clicking here. The truth is, you’re going to have a very tough time finding a substance with more CLA than grass-fed ghee. And really, since grass-fed ghee is almost entirely fat, can you imagine a better source? It depends on the exact diet of the cow where the butter comes from, but averages on total composition range from 40-60% of all ghee being CLA. Of course, there is a huge difference in getting something in its “whole herb” state vs isolated and alone in terms of assimilation and synergistics, but, for the sake of CLA consumption, you’re not going to find a much better source. And, if you didn’t read the article on CLA, let me just give you some brief reasons to add this amazing substance to your diet. This short-chain fatty acid has several known benefits. For one, it can work to help promote healthy gut function. We’re big believers here at Health As It Ought To Be if you can work to correct dysfunction in the gut it will do wonders for total health. To read more about gut health, follow this link. The reason grass-fed ghee can help is the butyric acid it contains is helpful in healing the sensitive cells inside of the intestines. This produces a therapeutic affect on the gut which allows for your intestines to both digest more efficiently and absorb nutrients with ease. Butyrate, and other short-chain fatty acids produced by gut bacteria**, has a remarkable effect on intestinal permeability. In tissue culture and live rats, short-chain fatty acids cause a large and rapiddecrease in intestinal permeability. Butyrate, or dietary fiber, prevents the lossof intestinal permeability in rat models of ulcerative colitis. This shows that short-chain fatty acids, including butyrate, play an important role in the maintenance of gut barrier integrity. Impaired gut barrier integrity is associated with many diseases, including fatty liver, heart failure and autoimmune diseases. This is yet another reason to consider grass-fed ghee. 3. 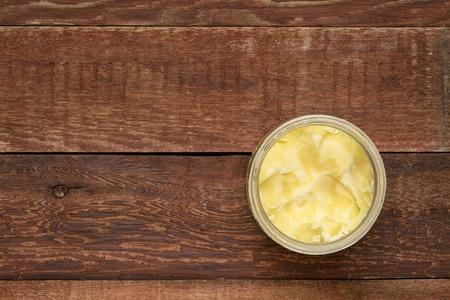 Ghee is rich in Vitamin K-2. You’ve likely seen us talk about K-2 extensively here in Health As It Ought To Be. This, of course, is because so many people just don’t get enough of it in their diet. Vitamin K-2 is typically found in fermented foods and grass fed meat and the byproducts of those meats (milk, butter). The reason ghee is such a perfect vehicle for K-2 is, again, because it’s grass-fed butter reduced to its most potent form. While ghee is a great place to find K-2, it wouldn’t be reasonable to depend on ghee alone for ample K-2 intake. To make it so you get enough, you should include other dietary sources (pasture-raised eggs, grass-fed meat, sauerkraut, and natto) to hit the sweet spot. Here’s a breakdown of animal based sources of K-2. True, you don’t see ghee on this chart, but depending on your serving size, you can expect there to be anywhere from 1.5-3 times as much as grass-fed butter (for the same size). If you’re still having trouble hitting the recommend amount, which is around 150 mcg, then supplementation is best. Vitamin K-2 has the unique property of working synergistically with vitamin D-3 to build strong bones. In fact, vitamin K-2 plays in active role in many processes. All this to say ghee should be included in your diet, especially if you want more K-2. Not to mention ghee has a higher smoke point than many other healthy cooking oils and at room temperature is easy to spread like butter. Yet another reason to add ghee. I recommend getting ghee online. It’s easy to find, and the price is a bit better than what you find in the stores.